In November, I sent out a post asking if you would be interested in blogging on Brian McLaren’s new book, Everything Must Change: Jesus, Global Crisis, and a Revolution of Hope. Many of you have responded in a positive way. So, a new page is being added to this site just for blogging on this book. First, you’ll see the heading for this new page at the top menu bar. Secondly, I attempted to create a new page that the link above goes to. The new page doesn’t allow us to blog, like the home page does. It only allows us to “Reply” to the original post. So, I’ve contact my web designer to create a new page that will allow us to blog in a better fashion (with headlines, etc.) This will be up and running in about a week. I’ve organized a system for reading to help keep us on the “same page” so-to-speak (or at least the same section of the book). I’m looking forward to being in Brian’s Deep Shift conference in San Diego (March). Reading this book with you will be a helpful way of preparing. It will also be a very helpful way of processing the information with each other. Meanwhile, if you are reading the book and have some comments to make, please reply to this current page. The comments will be transferred over to the new page when its completed. Also, if this reading schedule doesn’t match-up with your schedule, don’t worry about it! Please contribute to the conversation. The more who respond, the more challenging, inspirational and fun this venture will be!!! If this book blogging goes well, we’ll have to try another one afterwards! Any one familiar with Reveal??? Any one familiar with Willow Creek’s new study out called Reveal? It is not a bible study, but an assessment study. I am interested in hearing more… don’t really want to buy it but would love to hear your thoughts? Jeff… you probably should buy it and let us know what it is about! It might be helpful stuff for some of the churches you work with. Reminder for 300th Anniversary Video Contest! We are now less than 2 months away from the contest deadline for submitting videos. I trust there are people out there who are planning to enter one. If you are thinking about entering, please let me know. What does Christmas mean? Spend, Spend, Spend??? A few weeks ago, my wife and I were asked to create prayer experience stations for a worship service that focused on caring for God’s creation. Part of the experience was a good reminder of things I know, and part was a new learning experience of ecology facts I wasn’t aware of (like if everyone on the planet lived like we do in the U.S., it would take 4 Earths to supply all the resources). 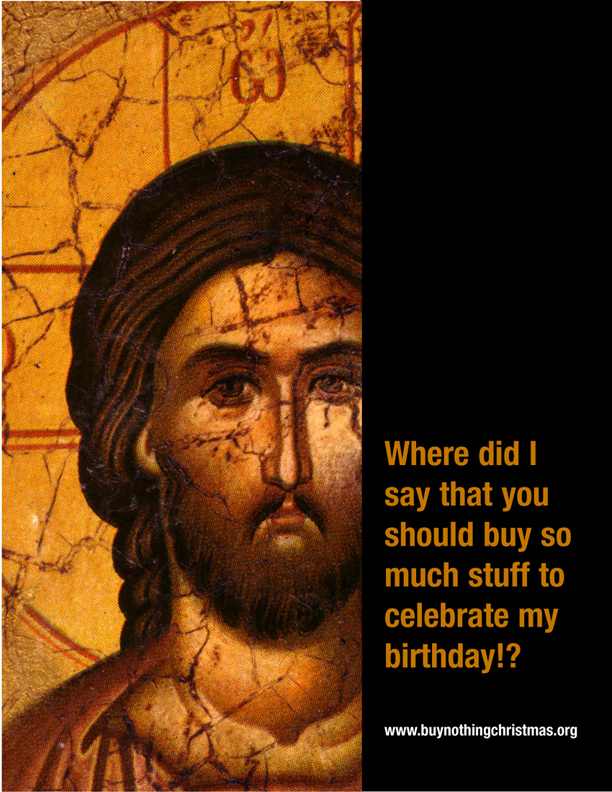 As we draw closer to our Savior’s Birthday, this thought of recycling and caring for the earth, is feeding a growing unrest in my heart with Christmas. We are all aware of how our culture drives us to spend, spend, spend in buying presents for your loved-ones. Our extended families have fought this trend by drawing names and buying presents for just that person, instead of for everyone. To help facilitate this, everyone is supposed to make a list of what they want for Christmas. I’ve been non-cooperative. Making lists of what you want just doesn’t feel right. What ever happened to, “Because I love you, I want to know you. Because I know you, I will know how to bless you.”? What is the best way to celebrate our Savior’s birth? Is it in buying lots of stuff? Recently I ran across the following . This comes from the website: www.buynothingChristmas.org. There are several more posters like this available to download for free. This poster has fueled my discontent for our current celebration for Christmas. Some emergent churches are also apparently discontent. One in San Diego has used this image to advertise their messages: Advent Conspiracy. Dan Kimball is preaching a similar sermon series this Advent at his church in Santa Cruz, CA. So, how can we best celebrate our Savior’s birth? Is spending less and giving more the proper way? Is spending more time with friends and family and less time running around shopping a better way? (Shopping less doesn’t just save money, it can reduce the amount of resources used to make stuff in addition to saving all the carbon dioxide your car produces as your drive around.) What about shopping at your local thrift shop as one way to recycle when you purchase gifts? I’m sure the Salvation Army or Goodwill can use your money more than the big box stores that we shop at. How do you celebrate Christmas? What’s most meaningful for you at this time? Blessings to you as you prepare for Christmas!